From the menu bar, click the Settings icon and select Partner / Account > Users. The New User page opens. In the Email text field, type the email address of the user. If you are going to create multiple users, use a comma to separate each email address. In the Roles section, select a role for the user. For more information, review the Associate a Role with a User topic. Scroll down to the Granted Access section and choose Group Permissions or User Permissions. You should apply Group or User permissions—but not both—since these permissions are cumulative. If you choose Group Permissions, click to select a group or groups from the Configure Groups list or click to filter the list and select from the filtered results. The application will apply the group permissions to the new user. For more information, review the Assign Group Permissions topic. 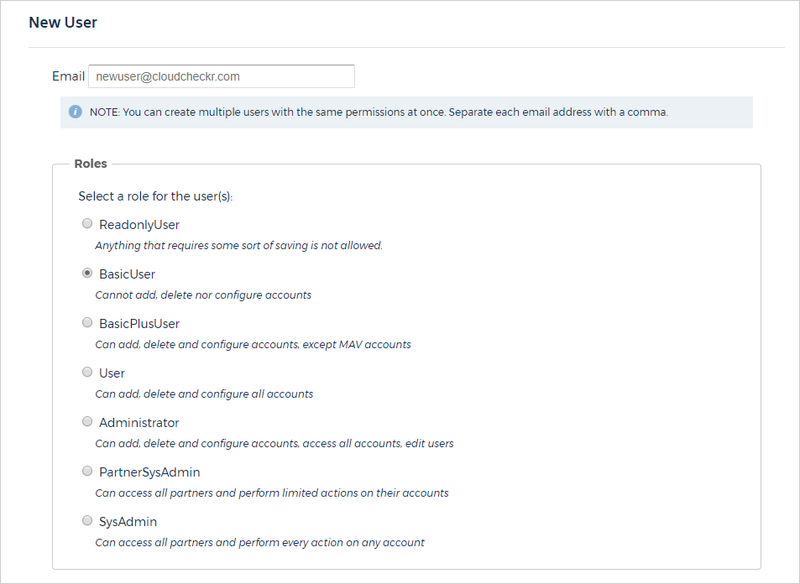 If you choose User Permissions, select the tab associated with the desired cloud provider and choose which accounts and reports from the list you want the user to have access to. For more information, review the Assign User Permissions and/or the Configure What Costs Are Visible to a User topics. 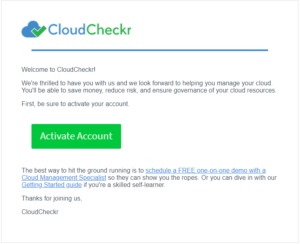 An activation email is sent to the email address for the new user. The Set a Password page opens. In the Password text field, type the password of the new user. In the Confirm Password text field, re-type the password and click Update. The new user is now listed as activated on the Users page.